Mark Siegner in one of the three houses he would like to demolish. The trash, debris, and waste he and his father removed from the structures filled eight 40-yard Dumpsters. Members of the Albany Landmarks Advisory Commission owe it to themselves to tour three derelict houses at Calapooia Street and Fourth Avenue before they decide on their owners’ request to demolish the structures. As I reported last week, Mark and Tina Siegner’s demolition request comes before the Landmarks board for a public hearing on Wednesday. On Friday I got a look inside these places, which the city police and building departments condemned as dangerous buildings last year. So did reporter Jennifer Moody and photographer Mark Ylen from the Democrat-Herald. A staff report to the Landmarks panel contends the Siegners haven’t met the criteria set out in the city’s development code for an immediate demolition of so-called “historic contributing” structures. But anyone who looks at the inside will likely conclude that these houses are too far gone and that renovating them, while theoretically possible, would never make economic sense. The Siegners are homebuilders with plenty of experience. 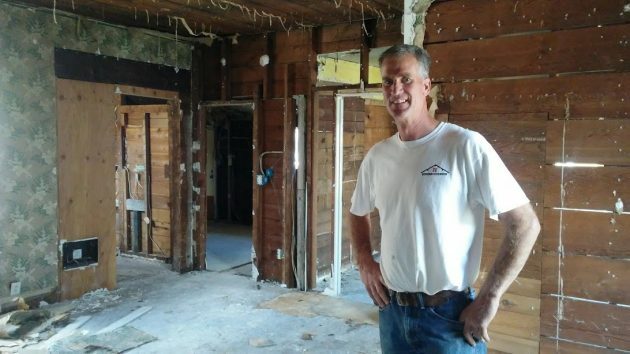 Mark says that each of the three needs completely new wiring, plumbing and heating systems. They also need rebuilding or replacing of the roofs, foundations, floor joists, stairways and porches. Work sheets listing all the repairs total about $350,000 for each little house. Mortgage payments would be about $2,800 a month, about twice what each house would bring in rent. Last spring, the Siegners’ request for financial aid to save the houses was rejected by CARA, the Central Albany Revitalization Area. They had planned to put up about half a million dollars of their own and asked for loans totaling $1 million, with half to become a grant upon completion of the renovation. 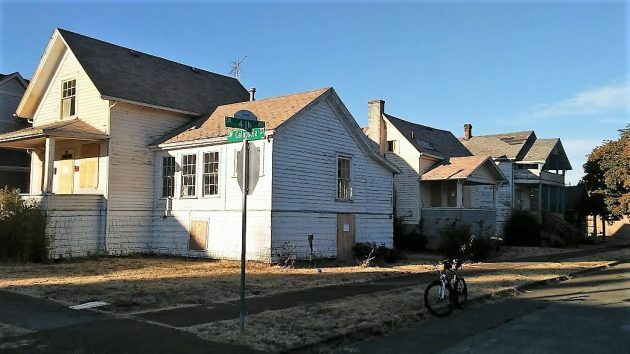 The owners have not developed plans, but they say that once the derelict structures are gone, the single tax lot they occupy would be a good spot for new housing that fits in with the neighborhood, on the north edge of the Monteith Historic District. Years ago they did something similar on the site of a demolished old house at the southeast corner of S.E. Second Avenue and Madison Street. The landmarks commission can approve the demolition, but it can’t deny it. If it does not approve it, all it can do is force a year’s delay, until July 9, 2019, the anniversary of when the application was filed. 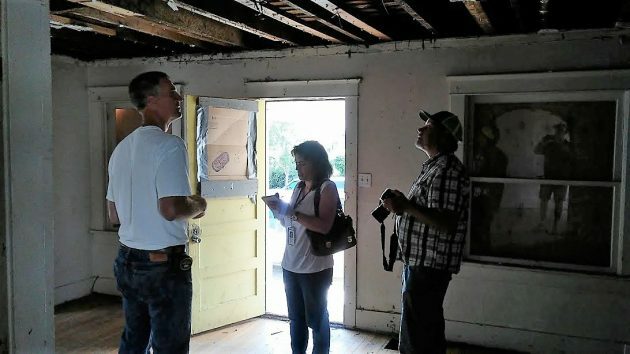 Siegner talks with the D-H’s Jennifer Moody and Mark Ylen inside one of the derelict houses Friday. 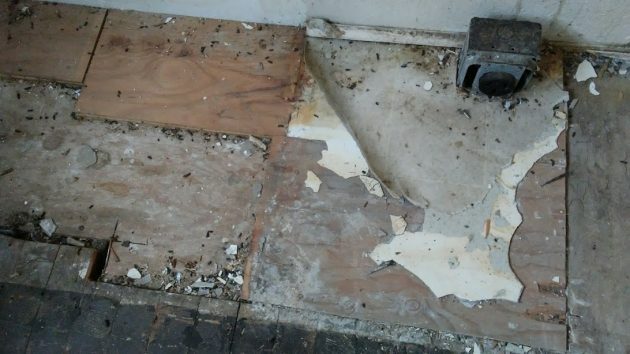 The houses, formerly owned by Signs of Victory Mission, have been mostly cleared of various messes, but rodent droppings remain. The houses from the outside on an evening this July. “Economic sense” disappears when you move from the private to the public sector. This is not to say that bureaucrats and elected politicians differ from other people. It’s just that when you have the power to spend other people’s money, or have the power to force how other people’s money gets spent, incentives and motivations radically change. Landmark Commission = Navel-gazing nonsense. If the Landmark Comission is so convinced of the historical value, then let them pony up a wad of cash to buy the trio of questionable homes. IndieGoGo, KickStarter…all manner of ways to measure whether the general public gives a hoot. In the age of Trump, transactional is king. Victors write history and other codes. To bend the arc of history, to rewrite those codes, one must be victorious.